Rachelle Durkin plays Lucia during The Chautauqua Opera’s dress rehearsal for Donizetti’s Lucia di Lammermoor at the amphitheater on July 4, 2012. Photo by Michelle Kanaar. How many dead tenors does it take to bring Gaetano Donizetti’s Lucia di Lammermoor to blazing life? Usually two. One portrays Arturo, the wealthy nobleman whom the conflicted heroine dispatches on their wedding night. The other is Edgardo, the mad maid’s true love — and enemy of the family — who stabs himself when he learns that Lucia has expired after doing her loony coloratura thing. 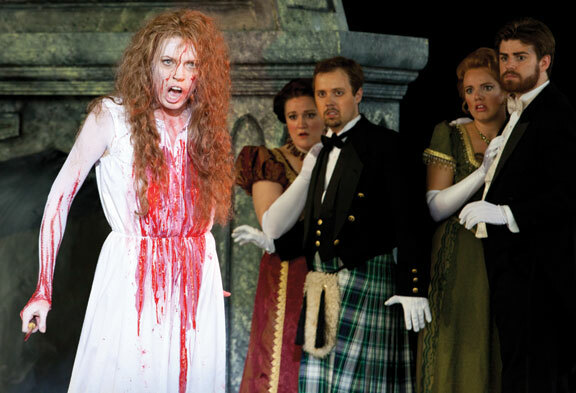 In Chautauqua Opera Company’s stirring production of Donizetti’s greatest hit Saturday in the Amphitheater, Lucia used her bloody knife on a third tenor, Normanno, during the mad scene. He’s the fellow who made major trouble by providing Enrico, Lucia’s dastardly brother, with a fake, forged note from Edgardo about an alleged infidelity. The increased body count wasn’t the only ghoulish touch in Jay Lesenger’s inventive staging. Even before Lucia sang her first aria — about a jealous young man who stabbed his sweetheart — the ghosts of those figures danced across the stage. At key moments throughout the opera, they returned to reinforce the theme of doomed love. Lesenger moved the Scottish action from the 17th century to the first year of the 20th century, soon after the death of Queen Victoria, as the audience learned from Enrico’s reference to her and her successor, Edward VII. If the updating of the opera — based on a novel by Sir Walter Scott — did little to heighten the drama, it also avoided the practice by too many stage directors of ignoring the work’s musical content and concentrating on theatrical indulgence. The production, performed in Italian with English titles, was anything but excessive. The handsome, atmospheric sets by Ron Kadri amounted to a series of movable pieces that transformed the stage from cemetery to drawing room to great hall and back again. B.G. FitzGerald’s period costumes and Michael Baumgarten’s poetic lighting were assets. And, happily, Donizetti received the careful and stylish consideration he deserved. There were moments when the Chautauqua Opera Orchestra, as the ensemble of members of the Chautauqua Symphony Orchestra was called, produced so much voluptuous sound from the pit at the front of the stage that voices became rumors. But Joseph Colaneri conducted with a superb blend of thrust, elasticity and nuance, and the orchestra was alert to his every gesture. “Lucia,” replete as it is with thrilling and ardent music, actually only makes an impact when the cast includes four principal singers who have a firm grasp of the art of bel canto — beautiful singing. The magic doesn’t happen often, but the Chautauqua production was fortunate to possess a quartet of artists with experience in the genre. Rachelle Durkin, who sang Norina in Donizetti’s Don Pasquale at the Metropolitan Opera under Colaneri’s baton, undertook the role of Lucia for the first time. It was an impressive performance. The Australian soprano made it clear that the woman is slightly off her emotional rocker from the get-go. Durkin played Lucia as a bundle of nerves with a tendency to go to extremes. In her tour de force of a mad scene, performed in blissed-out tandem with flutist Richard Sherman, she looked like the living dead — and even licked the blood from the knife she used to do in her husband. Donizetti’s florid writing can prove vexing if a soprano doesn’t have the technique to negotiate quick scales and wide leaps while supplying expressive subtlety. Durkin managed the demands with fierce and tender assurance. If her voice occasionally lacked steadiness of timbre, she brought penetrating meaning to each phrase and fearlessly projected Lucia’s high notes. Raimondo (Richard Bernstein) asks God to take pity on Lucia. Photo by Michelle Kanaar. The object of Lucia’s affection is Edgardo, who had a heroic champion in tenor Gregory Carroll. He sang the role with almost explosive fervor, employing a voice whose Italianate ring and ability to caress lines are rare qualities today. Carroll made a bold statement of Edgardo’s final aria, though he tired a bit near the end, and died forcefully over Lucia’s corpse. Lesenger’s decision to include the duet between Edgardo and Enrico was wise, not only for the way it clarifies plot points, but also because Carroll and baritone Todd Thomas gave it such a rousing account. Thomas’ Enrico came close to being thoroughly despicable, even though he showed a modicum of remorse in the sextet — a high point of the evening — and sang with stentorian authority. Richard Bernstein rolled out a marvelously sonorous and focused bass as Raimondo, who tries to talk Lucia into the marriage with Arturo to ward off Enrico’s political and financial ruin. Along with Carroll, the production claimed two other excellent tenors who someday are likely to graduate to Edgardo: Adam Bonnani as Arturo and Jason Wickson as Normanno. Courtney Miller was fine as Lucia’s companion, Alisa, when she could be heard. Nothing could keep the first-rate chorus, made up of Chautauqua Opera Young Artists, from sending streams of vocal glory through the Amp. And one mustn’t forget those ghosts, Molly Vine and Shawn Sprankle, from the Chautauqua Regional Youth Ballet, who swooned and floated with macabre elegance. Donizetti and librettist Salvatore Cammarano might have been surprised by their presence but also intrigued. Donald Rosenberg has written about music for The Plain Dealer in Cleveland since 1992. He is the author of The Cleveland Orchestra Story: Second to None and president of the Music Critics Association of North America.